On the south end of Millennium Park, to the east and west of Lurie Garden, are two 1,000-square-foot pavilions that provide access to the parking facility below from Monroe Street and the park level. Designed by the renowned architect Renzo Piano, these two structures feature limestone and glass facades and mirror the Renzo Piano-designed addition to The Art Institute of Chicago, to be built directly across Monroe Street. 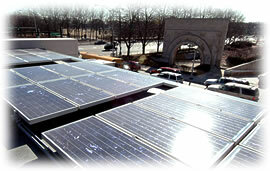 These pavilions also incorporate solar technology. The east and west pavilion solar systems are 1.9 kW and 1.3 kW, respectively, and together they are expected to generate 3,840 kilowatt-hours per year. 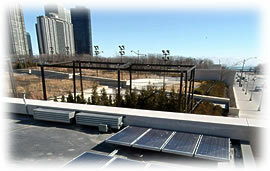 These solar electric systems combined consist of 40, 80-watt standard modules manufactured by Solar Spire Chicago that are installed on the roofs of the pavilions with a south face orientation.